Opera Collective Ireland (formerly Irish Youth Opera) is back after a two-year absence, with a production of Benjamin Britten’s Owen Wingrave. Originally commissioned by the BBC in the late 1960s for television, it’s a work that’s not often staged, and attracts a good-sized and curious audience, looking forward to seeing this rarity. The story tells of a young man, Owen, who goes against his family’s long military tradition by declaring himself a pacifist, braving the consequences to the bitter end. Renouncing the battlefields of war, he instead finds himself in the firing line of a toxic homelife. An intimate, family drama that happens to be an opera, it was an astute choice for the small screen, and the work’s radical pacifism is possibly more relevant now than ever. Having created vividly naturalistic settings in previous productions (the schoolyard Magic Flute for RIAM Opera in 2016 or, more recently, the rural Irish pub setting of OTC’s Acis and Galatea), here director Tom Creed takes the opposite approach. The realism described in the libretto of Owen Wingrave is exchanged for a starkly symbolic space. A forbidding wall serves as the constant backdrop, supplemented—once we step into the ‘home’ environment—by stuffed birds-of-prey on plinths, standing in for family portraits. Apart from a few sparse props, there is no furniture, and nothing distracts the eye from the cruel beauty of the drama. Using the proximity of the performers on stage or graphic back-projections, Creed also creates compelling stage images, all contributing to the unfolding story. The young cast work well together, with some very fine performances. 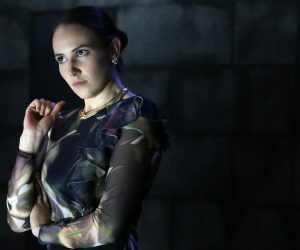 This is truly an ensemble piece, making it unfair to single out individual artists, but soprano Amy Ní Fhearraigh—enjoying a rapid rise—delivers a stunning performance here as Mrs Julian, her voice and physicality creating a character of delicious fury, while Benjamin Russell is transformed in the title role, singing with superb intensity. We also see sympathetic performances by Peter O’Reilly and Rachel Croash. Projecting text has proved problematic in this venue for singers in other shows, but it’s not a problem tonight. The ensemble, members of the Irish Chamber Orchestra, brings out the colours of Britten’s score beautifully, and conductor Stephen Barlow mostly achieves a gentle balance, with the players only occasionally overwhelming the singers—not an easy task. As with 2015’s Agrippina, Opera Collective Ireland has once again delivered a compelling evening of music drama. Happily appearing the same week as the initial unveiling of a new company, Irish National Opera, one can only wonder what these artists will be doing next.